Enda Kenny paid a visit to Germany today. GERMAN CHANCELLOR ANGELA Merkel promised to help Ireland protect its interests in Brexit negotiations as she met with Taoiseach Enda Kenny in Berlin today. Kenny’s trip to Germany was his first European visit since the UK formally gave notice last week of its plans to leave the European Union. Inside as the two leaders gave statements to the press, RTÉ reports that Merkel acknowledged that Ireland has a specific interest in Brexit negotiations. “We are all familiar with the situation of Ireland, and with the very, very important issues of war and peace,” she said. As European partners we will try to help Ireland safeguard its interests. Speaking in Brussels in February, Kenny made clear that any Brexit deal must include a provision to allow Northern Ireland to rejoin the EU should reunification with the Republic ever happen. Kenny has previously made the comparison of Irish reunification with that of German reunification and pointed out that, in that case East Germany, it did not have to apply to join the EU when it was absorbed into West Germany. Speaking at today’s press briefing, Kenny said that any agreements with respect to Ireland must honour EU law. “This is a political problem and we will have to be both creative and imaginative in dealing with it,” he said. Email “'Come in, I missed you' - Merkel gives Kenny Brexit boost in Berlin meeting ”. 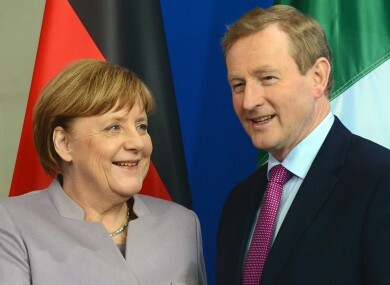 Feedback on “'Come in, I missed you' - Merkel gives Kenny Brexit boost in Berlin meeting ”.